Gluten-free or not, it is always beneficial to bake your own! What the heck are gluten? Gluten have been getting a lot of bad press. But what are gluten? Starting with the flour: Flour is milled grains. For example, wholewheat flour consist of the whole wheat grain milled into a fine flour. Everything from the grain is incorporated in the flour, the bran, the germ with lots of minerals and enzymes, the endosperm consisting of starch and of course the gluten. The amount of gluten depend on the type of grain. Some contain almost none, and some types contain a lot of gluten. The grain we use most often in our food are wheat, rye, barley, oats, spelt and kamut. Gluten are a mixture of proteins with viscose-elastic properties, a bit like chewing gum. Gluten are the main structure builders in your bread, they hold the air and give your bread a chewy and elastic texture. When you knead your flour and water into a dough, the wet gluten interlink with each other and form a web. 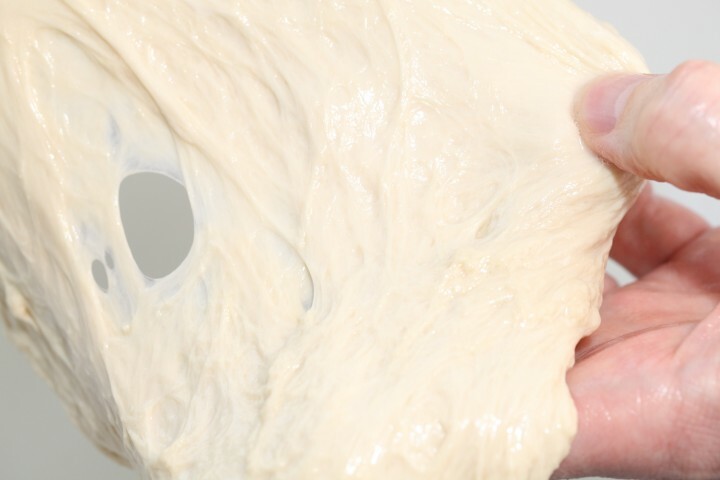 The longer you knead the more links are being formed and the tighter your dough will get. These links are also formed automatically when wet dough is left alone for a while (the autolyse process) and during bulk fermentation. This is why your dough also gets stronger during these steps. The carbon dioxide gas produced by yeast is trapped within this web of gluten, a bit like air inside balloons. This is what makes your dough rise. Next to kneading and time, gluten are also developed and influenced by the amount of water, water quality, temperature and the addition of other ingredients (salt, milk, milk) and chemicals / additives (enzymes, conditioners) in a recipe. Just like different quality balloons, some flours produce very tight balloons which are hard to inflate, and some flours produce very slack balloons, which are easy to inflate but can also easily break. 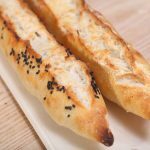 The most important proteins within the gluten are gliadin and glutenin, the balance between these proteins defines the baking properties of the flour. Which means dough can be elastic and very springy, but dough can also be very extensible, depending on the type / brand / kind of flour. The glutenin contributes to the strength and elasticity of your dough and the gliadin contributes to the extensibility. For most bakes you want lots of extensibility (stretching without breaking) and not so much elasticity. When you make pizza for example, you want to have an extensible but not very elastic dough. This way it is easy to roll out and it does not spring back. When you are making fluffy light diner rolls, it is good to have strong ‘balloons’ which can trap a lot of carbon dioxide. 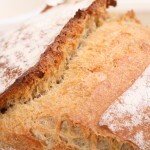 For this you need a flour with lots of gluten, a bread flour high in protein. To get an idea of what gluten ‘look and feel’ like, we did a little experiment by washing out the flour from a ball of dough. It is very easy to do. Make a dough containing only water and bread flour, so no yeast or salt. We used a Manitoba bread flour with a 14% protein content for our experiment. Knead the dough for 5 minutes into a tight ball, cover and store for 60 minutes. During this time the gluten will develop a tight web of links inside the dough. Fill a bowl with cold water and ‘knead’ your ball of dough while keeping the dough under water. This way you wash out all the starch from the flour. The water will turn milky white after a while. Refresh the water and continue kneading the ball of dough until the water does not turn white anymore. Slowly but surely your ball will get smaller and you will end up with a ball of pure grayish-beige gluten which feels squeaky like chewing gum. Let this ball relax for an hour inside a bowl of fresh clear water. After this hour your gluten chains have relaxed and you can now stretch these gluten beyond believe. Just try it yourself! So, the more gluten the better? You would be tempted to think that when it comes to bread baking, the more gluten the better. But this is too simple a statement. You will not be surprised that there is of course an optimum amount, depending on the recipe you are making. When bread dough contains too much gluten it loses its extensibility and springs back too much, making it difficult to work with and resulting in a bread that is tough and has lower volume and a compact crumb. Lack of gluten, especially with breads that are free form baked without support of a bread tin, can result in collapse of the dough. With our own bread baking, we have experienced that not enough gluten results in collapse of free standing loafs and too much gluten results in a compact crumb without the so desired large holes. 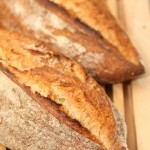 The protein content of the flour we use when making rustic bread, giving us the best result, lies between 12 and 13%. Without getting too technical, the next part is a (over-) simplification of the processes happening when making your own bread. The bulk of the flour consists of starch which are carbohydrates in glucose form, bonded together into long chains. When making bread, during bulk fermentation, these long chains are cut into smaller pieces. The yeast, enzymes and the bacteria from sourdough do most of this work. It takes a couple of hours for this to happen. So bread which has been made in a hurry, like most factory and supermarket bread, still contains a lot of the original long glucose chains, the raw flour, and less of the smaller chains. These long chains are harder to digest and this makes most factory bread harder on your internal system. The long bulk fermentations, the use of poolish / preferments, smaller quantities of yeast etc, all help you to make bread that is easier to digest and more complex in taste. The yeast, enzymes and bacteria are doing the hard work for you, transforming complex carbohydrates into easy to digest (for example) maltose pieces. The factories are compensating this valuable time with lots of additives, extra added enzymes, intensive kneading, aroma’s etc. All this to make up for and hide the fact that the bread is made too quick. Sadly these shortcuts and unwanted ingredients give bread a bad reputation because they can lead to all kinds of health problems. Except of course for people with Coeliac disease, an autoimmune disorder affecting primarily the small intestine, and people with obvious gluten intolerance, if you have never been tested but think you might have a problem with digesting gluten, why not try to bake your own ‘slow’ bread without additives and enzymes and see how your body reacts. Because if you buy bread from a supermarket or a baker that uses additives and bread enhancers there is a chance your internal system is protesting against raw flour and other things you do not need or want in your bread and will never add when baking your own! We are absolutely no experts on gluten-free baking, except for the odd pancake. We know it can be a challenge to produce a good gluten-free loaf of bread and you always need a mix of gluten-free flours to get a satisfying result. There’s lots of websites and blogs to be found full of gluten-free information and recipes. Below is a list of the most popular gluten-free flours for bread baking. So, if you want to see the difference between the bread with gluten you normally bake and a gluten-free version, try and make a loaf with flour from the list below. Millet flour – Millet flour can be made from a number of highly variable small-seeded grasses – While glutenfree, people intolerant to gluten can still react! Tapioca flour – Made from the cassava plant roots. Useful because of thickening and binding properties. Not much nutritional value. Flours that have different properties, protein levels, gluten properties and taste profiles than wheat but are not gluten free are rye, spelt, barley, oats, kamut, einkorn and emmer. Adding these to your recipes can make the baking more of a challenge but can also lead to interesting new tastes and textures. We do not know how to help you exactly. The amount of protein you mention is indeed very high. We find it curious a miller should not be able to answer your questions, but maybe you have to ask for the ‘head miller’ or something to find out more. The bread flour we use contains around 12.5% protein. We do use Manitoba sometimes that has around 14%, but we do not recognize the tough and rubbery result that you mention. It might be a result of over-kneading? We know with pizza, it is not only the amount of gluten but also the type that is important. We would suggest to use a mix of all purpose and this flour (50/50) for your bread baking and see how that goes. The result should be better. Thank you for your informative page/blog. I am a weekend baker and I use fresh milled flour exclusively. I find it challenging to bake sandwich bread with consistency. I have use added vital wheat gluten and have seen slightly better results but still not a great rise for a full loaf. I am sure there are many variables to consider, what I am wondering is if there is a formula to consider regarding the amount of yeast/sugar, kneeling time with a dough hook, and rise time and how many rises. Also, I use hard white wheat from Utah, and I live at 5100 feet elevation. Thanks for any tips or tricks to try. I have a question. I am making artisan bread at home which I have stated recently. If I use autoleyse after the folur and water part when I add the yeast, salt. does the proofing ia srill 15 or 20 hours? Normally the autolyse is between 30 and 60 minutes. Then you add the salt and yeast. The bulk proofing times depend on the recipe but are often between 2 and 4 hours in our recipes. Your 15 to 20 hours sounds very long. The knowledge of gluten was very good. I learned a lot of information. Thank you. Thank you Mr. Salur for finding it helpful. Glad to hear it. 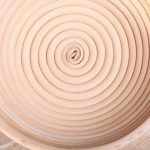 My question is, when kneading by hand, using slap and fold, or stretch and fold, How can I tell that I have developed my gluten enough, and how can I prevent myself from overkneading the dough? Is it possible that I get less oven spring because of too much kneading by hand preparing my final dough? Two loafs further I see that this is not a very simple question, but asking a question is the beginning of the anwser, I start to get used to higher protein / gluten content, if it is hard to perform stretch and fold actions because the dough behaves like the rubber in my good old slingshot, I am probably too far get a good oven spring. My last batch ended well restraining myself while performing the slap and folds, Had half wholemeal 14% protein, a quarter white flour 14% and another quart white flour 11% protein. At hydratation 70 % I proceeded until I had a dough which left my work surface allmost clean but still a bit sticky to the hands, I keep on trying! I have seen that allso the shaping of the loafs makes difference in oven spring, so the gluten are still full of surprises. Yes, shaping and especially creating surface tension is very much part of creating a loaf that also gets good oven spring. Getting used to the stickiness and performing each action with efficiency so your hands are less and less in actual contact with the dough. Excuse, I had completely overseen your article on kneading, that is where your infomation about gluten development is. Is there any danger in cutting out foods with gluten even if I’m not intolerant to it? Our own mantra is ‘make your own with lots of variation’. 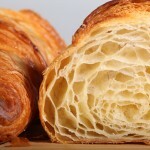 my family are coeliac, i think i need to investigate a blend of rice, potato and tapioca with xanthan gum to try and replicate the croissant recipe on here. if i can get it to behave like normal then this christmas should be amazing! thank you though, as we are coeliac it is one thing to try and follow a recipe from a book its another to follow a bakers recipe. Best of luck with it and hope it will be a great success, adding to the Christmas joy. Let us know how it goes. Sorry we cannot give you any more helpful tips on the subject based on own experience. I have been extensively researching flour quality, protein and gluten recently due to Bread Maker failure, and “customer service” More of that another time. 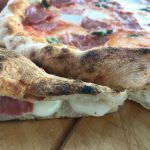 This article colours in a lot of detail regarding what is going on when you mix and knead dough. Much appreciated! Glad to read the time table has aided you with your baking too. I like your approach to this controversial subject. Like most everything, it has its place in the food world. Thanks so much for the information about gluten. I like gluten and perhaps over use it in some of my bread. We thank you and we feel lucky we have the luxury of time and attention to bake real bread.